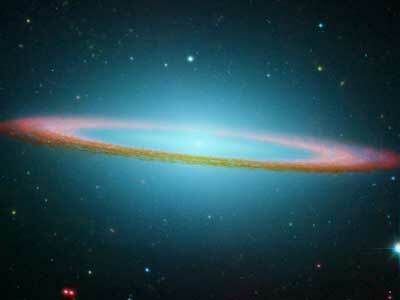 Sombrero Galaxy - Universe Galaxies And Stars Section. 1024x768 desktop wallpaper of the Sombrero Galaxy taken by Spitzer. Image credit: NASA/JPL. NASA salutes Space Day, observed this year on May 5, with a new dramatic image of the Sombrero galaxy. Space Day, held the first Thursday each May, is designed to inspire the next generation of explorers. The galaxy, called Messier 104, is commonly known as the Sombrero Galaxy because in visible light it resembles a broad-brimmed Mexican hat called a sombrero. The new Sombrero picture combines a recent Infrared observation from NASA's Spitzer space telescope with a well-known visible light image from NASA's Hubble Space Telescope. The new Sombrero image is available at www.spitzer.caltech.edu/spitzer. Spitzer adds new detail to the galaxy's bright, bulbous core and its thick, outer dust lanes. Infrared light traces the dust and makes the dark, murky ring glow brilliantly. The clumpy dust ring also becomes transparent in infrared. This allows a clear view of the inner disk of stars within the dust ring. The Sombrero is one of the most massive objects at the southern edge of the Virgo cluster of galaxies. It is equal in size to 800 billion suns. This spiral Galaxy is located 28 million light-years away and is 50,000 light-years across. Viewed from Earth, it is just six degrees away from its equatorial plane. The Hubble images were taken by the Hubble Heritage Team in May through June 2003, with the telescope's advanced camera for surveys. Spitzer's images were taken in June 2004 and January 2005 as part of the Spitzer Infrared Nearby Galaxies Survey, using the telescope's Infrared array camera. The survey is one of the six Spitzer Legacy Science projects designed to reveal how stars form in different types of galaxies, and to provide an atlas of Galaxy images and spectra for future archival investigations. The Sombrero is one of 75 Galaxies being observed by the survey team. The Spitzer space telescope and Hubble Space Telescope are part of NASA's Great Observatories program, which also includes the Chandra X-ray Observatory and the previously operating Compton Gamma Ray Observatory. NASA's Jet Propulsion Laboratory, Pasadena, Calif., manages the Spitzer mission for NASA's Science Mission Directorate, Washington. Science operations are conducted at the Spitzer Science Center at the California Institute of Technology in Pasadena. JPL is a division of Caltech.